Digi-Schlock: THE NEST (Scream Factory Blu-Ray/DVD Combo Pack) – Schlockmania! For a long time, The Nest was one of those lesser-known favorites whose relative obscurity doomed it to mediocre home video treatment. It was issued on VHS and DVD during the heyday of those formats but both versions used the same weak-looking, standard definition transfer that was passable but less than complimentary to the film itself. Thankfully, Shout! Factory – something of a patron saint for latter-day Roger Corman-related fare – picked this title up and gave it an unexpected but welcome blu-ray/DVD combo pack that represents the nicest treatment this film has ever had on home video. 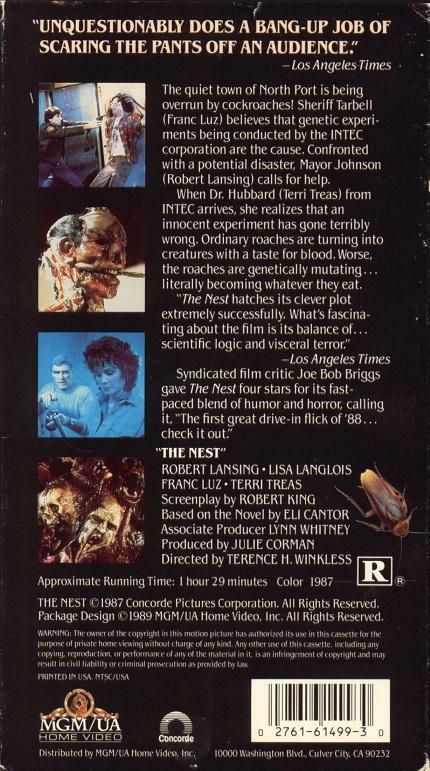 Like all the other Scream Factory releases, The Nest has been given a fresh high-definition transfer. The blu-ray is what was viewed for this review and the results are pretty impressive. Though The Nest was made quickly and cheaply, it boasts good cinematography for a film at this budget level and this new transfer makes the most of it. The film benefits from the bump in clarity and color that it gets from the blu-ray format, particularly in the night scenes and a sequence near the end that makes effective use of primary-colored lighting. This transfer is supported at the audio level by both 2.0 and 5.1 stereo mixes on the DVD. Oddly, the blu-ray features the same 2.0 stereo mix twice due to a technical error. This is unfortunate but that original 2.0 stereo mix gets the job done. There is only one extra to speak of in this set but thankfully it’s a good one: a commentary track with director Terence Winkless. It’s a very eventful track: Winkless seems “shot out of a cannon” as he dives right in and gives a scene-by-scene chronicle of his work on the film. He describe how particular visual or technical effects were achieved, namechecks the friends and relations that he got to work as extras and goes into detail about working with the various cast and crew members. Winkless is also critical of his work as a first-time director, pointing out the flaws and describing a better way to handle those particular moments. He reveals how got the gig and discusses the experience of working with the Cormans. It’s a fun, nuts-and-bolts track that doesn’t have a second of dead air. If you’re a b-movie buff, you’ll find it as entertaining as it is informative. All in all, this is a solid edition of a deserving b-movie. It might be a little lighter on bonus material than other Scream Factory efforts but the good transfer and the strong commentary track make it worth the time for monster movie fans. To read Schlockmania’s film review of The Nest, click here.